Alex Bolen, the chief executive of Oscar de la Renta, planned to have his new store in Paris open around this week, just in time for the couture shows. He planned to have a presence in the city even if he didn’t have a show. He had it all figured out. Then, last summer, in the middle of renovations, Mr. Bolen got a call from his architect, Nathalie Ryan. “‘We made a discovery,’” he remembered her saying. On the other end of the phone, Mr. Bolen cringed. The last time he received a call like that about a store, their plans to move a wall had to be scrapped because of fears the building would collapse. He asked what, exactly, the discovery was. “You have to come and see,” she told him. Something had been hidden behind a wall, and it wasn’t asbestos. It was a 10-by-20-foot oil painting of an elaborately coifed and dressed 17th-century marquis and assorted courtiers entering the city of Jerusalem. So when the painting was found, and it became clear Mr. Bolen would have to talk to the building’s owners, whom he had never met (the lease had been negotiated through a broker), his relative was able to make the introductions. Another de La Rochefoucauld, who happened to work at the Louvre, got a recommendation for an art historian: Stephane Pinta of the Cabinet Turquin, an expert in old-master paintings. 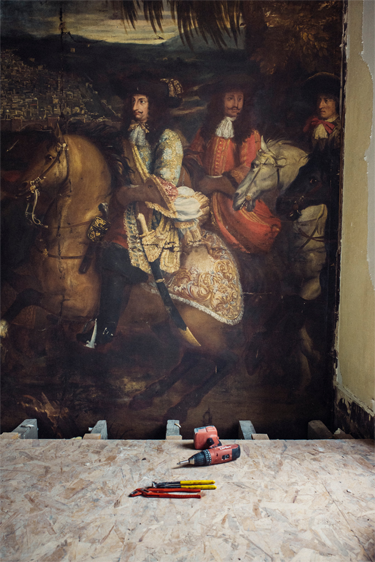 Mr. Pinta determined that the painting was an oil on canvas created in 1674 by Arnould de Vuez, a painter who worked with Charles Le Brun, the first painter to Louis XIV and designer of interiors of the Château de Versailles. After working with Le Brun, de Vuez, who was known for getting involved in duels of honor, was forced to flee France and ended up in Constantinople. Mr. Pinta traced the painting to a plate that was reproduced in the 1900 book “Odyssey of an Ambassador: The Travels of the Marquis de Nointel, 1670-1680” by Albert Vandal, which told the story of the travels of Charles-Marie-François Olier, Marquis de Nointel et d’Angervilliers, Louis XIV’s ambassador to the Ottoman Court. On Page 129, there is a rotogravure of an artwork depicting the Marquis de Nointel arriving in Jerusalem with great pomp and circumstance — the painting on the wall. But how it ended up glued to that wall, no one knew, nor why it was covered up. There was speculation that maybe it happened during World War II, given the setting. It could be “a fog-of-war issue,” Mr. Bolen said.